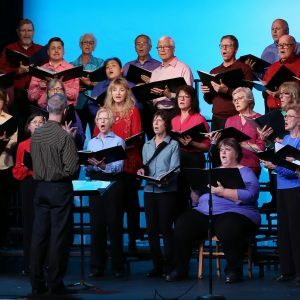 ​The 40-voice Allegro Community Chorus​ intends to uplift and inspire at their winter concert on Friday, December 8 at Cutting Hall Performing Arts Center​, 150 East Wood Street, in Palatine. Beginning at 7:30pm, the first half of the program features non-holiday music drawn from musicals, spirituals, popular songs both old and new, while the second half will be focused on traditional Holiday tunes. A few of the non-holiday selections include the spiritual “Ain-a That Good News,” Julie Shannon’s powerful anthem “One Breath,” an appeal for peace in a troubled world, and an old rock favorite from Three Dog Night. Featured Holiday classics will include a jazz-rock take on “Frosty the Snowman,” a really moving arrangement of the carol “Lo, How a Rose” with the popular song “The Rose,” and a final showstopper from the movie, Sister Act 2: Back in the Habit. Registration for the winter/spring chorus session is now open to residents with rehearsals beginning on January 17 at Community Center. Non-resident registration will be available online beginning December 12. Allegro Community Chorus rehearsals are once a week on Wednesdays from 7:00pm-8:30pm. No audition necessary. Registration is available online through palatineparks.org​, as well as in person at Birchwood Recreation Center​, Community Center, and Falcon Park Recreation Center​. For more information and previous performance video clips, visit the chorus website at allegrochorus.org​. Registration questions and other inquiries can be submitted directly to chorus staff on the contact page​ of the website. Questions may also be directed to Cultural Arts Coordinator Ashley Schiavone at 847.496.6237 or aschiavone@palatineparks.org.